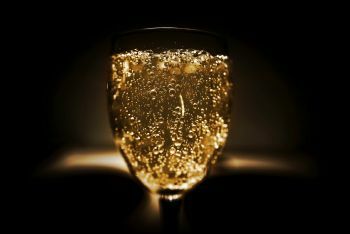 The classic sparkling wine that has rung in countless new years with a bang may have more to its bubbles. Champagne is notable for its iconic cork popping, but the bubble acoustics also play a key role in determining how expensive that bottle should be. Investigators Kyle S. Spratt, Kevin M. Lee and Preston S. Wilson, from the Applied Research Laboratories at the University of Texas at Austin, presented their research the acoustical measurements of champagne bubbles during the 174th Meeting of the Acoustical Society of America, held Dec. 4-8, 2017, in New Orleans, Louisiana. "The point of the project is to study the sounds that champagne bubbles make, and to see what we can infer about the bubbles from the sounds that they make," said Spratt. "Bubbles are very resonant. They basically ring like bells, and the frequency of that ringing depends in part on the size of the bubbles. There is a well-known notion that the quality of a sparkling wine is correlated to the size of its bubbles, and we are investigating whether the bubble size distribution of a sparkling wine can be obtained from simple acoustical measurements." The team typically investigates the properties of bubbles and how they relate to underwater acoustics using a hydrophone, a piezoelectric transducer-based device that records underwater sound. They thought a similar technique might apply to the investigation of wine bubbles. "When we came across the idea that bubbles play an important role in the quality of a sparkling wine, our first instinct was to drop a hydrophone into a glass and see what kind of sound we can hear," said Spratt. Gathering data proved to be difficult due to the properties of the wine and its bubble mechanisms. "The process of taking measurements in a carbonated beverage was more challenging than we expected, mainly because bubbles form on the hydrophone itself and that can greatly affect the data that is collected," said Spratt. To prevent from altering the properties of the champagne bubbles, researchers resorted to using a very small hydrophone. The champagne flute design is not just to look arbitrarily fancy, having a great deal of effect on bubble formation. "A wine glass is also a resonant object, so another challenge for us was to make sure that the characteristics of the glass itself weren't biasing our measurements in some way," said Spratt. However, attempting to take measurements in other containers, especially Styrofoam, left little to be desired. "It turns out the bubble formation process on Styrofoam is completely different than on glass," he said. "So, if you ever have to resort to drinking champagne out of a Styrofoam cup, the bubbles will be quite different." The applications of this work could prove useful for aiding in the quality assurance testing of sparkling wines and other carbonated beverages. Using the acoustic properties of the bubbles as an indicator for wine quality could prevent errors in commercial manufacturing or packaging that may not be detectable by taste alone.